When film director Larry Trimble decides that the next big thing for Hollywood movies should be a dog, he and his assistant Jane find a German Shepherd puppy who proves to be just right. The German born Etzel is rechristened Strongheart and after some training, begins his career in films with The Silent Call. Strongheart is an uncanny actor, and Trimble feels that he can actually communicate with the dog. The films are a success, and Strongheart endorses dog food, visits orphanages, "marries" his costar, Lady Jule, and signs lots of pictures with his "pawtograph". Fame has its price, of course, and he is embroiled in a case where parents of a young girl who is lost in an underground tunnel after trying to retrieve Strongheart's ball accuse the dog of savaging her daughter. Luckily, the boys in the orphanage do detective work in the tradition of the best "dime novels" and prove that Strongheart is not responsible. The noble German Shepherd is able to resume his career and enjoy life with his growing family. 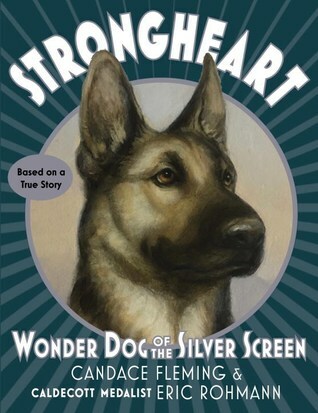 Strengths: This is a delightful, fictionalized account of a real dog movie star. It is interesting that after 90 years, there is not enough information about Strongheart's origins to know exactly whence he came; we are so used to everything being documented electronically that this gave even me some pause! This is probably why this took the form of a novel rather than one of Fleming's excellent nonfiction book. The illustrations by Eric Rohmann are charming and will appeal to readers who love dogs as well as... who doesn't like cute dog pictures? The notes at the back about the "real story" are helpful, and it's nice to have some links and a bibliography to investigates. Dog books are always in demand, and this is a particularly engaging one. Weaknesses: It's a shame that a bit more coverage wasn't given to the concept of silent films. While this can certainly be enjoyed without it, modern 12 year olds don't understand life without computers, much less life without films that have sound. There are clips of Strongheart available online, and interested readers who look these up will likely be very confused by the concept of a silent film! Considering that I recently had to explain the concept of a "Sunday Drive" to a 25 year old, and there are teachers at my school that didn't know there was ever a nongraphic internet, some more explanations wouldn't have gone amiss. Technology moves quickly! What I really think: Can't wait to hand this one to students! 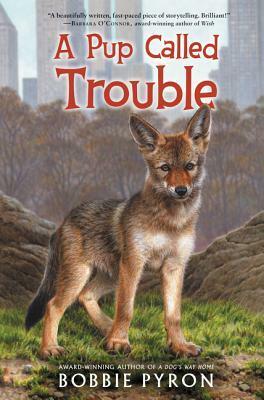 Trouble is a coyote born into a loving and supportive family out in the country. He is more mischievous than his brothers and sisters, but loves tussling with them and investigating the world around him. When he sneaks into a produce truck from a nearby farm that is heading into the city, he soon finds himself in a different sort of wild-- New York City! Coyotes are rare in the city, so he alarms a variety of people who see him, especially after he manages to get into an office building. Trouble manages to make a home for himself and makes friends, including Mischief, a crow, and Rosebud, an oppossum. He even makes friends with a little girl, Amelia, who comes to the park. Even though he has managed to carve out a comfortable existence in the city, Trouble misses his family, and with the help of his friends, manages to get back to them. Strengths: Like Hill's Lucky, Lorentz' Dogs of the Drowned City, and Hunter's Warriors books, this is a fast-paced story of an animal out of its element. Trouble is an engaging character, the inclusion of Amelia will make this easy for tweens to relate to, and the cover is adorable and will make sure that this book is never on the shelf! Also, put me in mind a little of Selden's A Cricket in Times Square. Weaknesses: Coyotes. A bit evil. They will carry off small dogs, so Sylvie does not approve. What I really think: Pyron's work (The Dogs of Winter and A Dog's Way Home), is very popular in my library, so I will have to purchase! Two elementary school students clearly enjoy spending time together, and the boy is especially fond of the girl. Throughout the day, he gives her little gifts that he clearly states are NOT Valentines, since they are not the stereotypical pink, glittery, lacey, sugary sorts of gifts that most people give. Instead, he gives her gifts that he know she will like such as a red superhero cape, a ring that matches her shoelaces, and a rock. 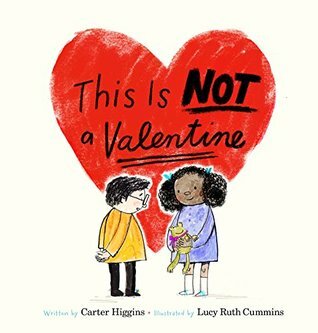 At the end of the book, the boy tells the girl that he likes her "all the days the school bell rings" and not just on Valentine's Day. This is a good message of friendship, and listening to the preferences of one's friends. The artwork imitates a child's drawing, and is bright and dynamic. This is a seemingly simple title, but delivers a timely and important message that realationships, even among the young, need to be mutually respectful and caring. I wish that we had heard more from the little girl; while the boy's actions are all kind and adoring, it would have been interesting to see how the girl responded. The Strongherat book looks great. I hope our system has it! And coyotes have been spotted in our neighborhood. We have to be careful if our medium-sized dog starts getting noisy and frantic to go out in our back yard at night--we have to look first and make sure she hasn't scented a coyote.